SAMR is one of the relevant learning models teachers can use to effectively integrate technology in education. I have been doing some readings into it and have also posted a wide variety of articles and graphics on what teachers need to know to apply this model in their technology practices in the classroom. I invite you to check this section to access the resources I have compiled over the last couple of months. Today I am sharing with you a great Prezi presentation created by Jim Cash and entitled " SAMR Examples ". In this presentation, you will get to learn about some of the ways you can use SMAR model in each of its stages. 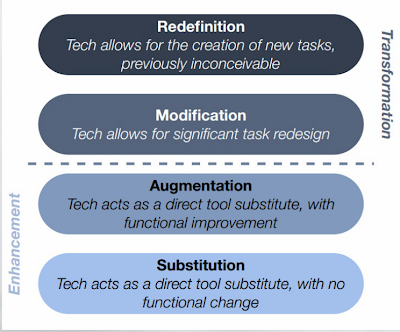 tech allows for the creation of new tasks, previously inconceivable. technology acts as a direct tool substitute with no functional change.